Kenpo karate blends circular movements like those found in Kung Fu and linear movements typical of Japanese martial arts systems. Skilled Kenpo Black Belts are marked by their ability to fire off powerful techniques with blinding speed, hitting multiple targets within seconds. Where some Arts may emphasize hands or feet, Kenpo utilizes and blends both for devastating effectiveness in a minimum amount of time. Kenpo employs a wide variety of blocks, strikes, kicks, punches and mental awareness exercises against an attacker. Advanced Kenpo consists of 154 unique self-defense techniques. 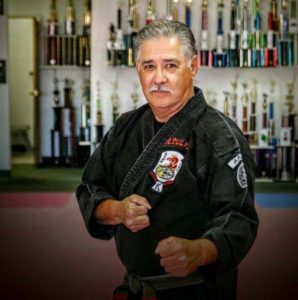 Master John Sepulveda has over 50 years experience in Advanced Kenpo and holds a 10th Degree Black Belt. Mr. Sepulveda is the founder of the Advanced Kenpo Training SystemTM. The AKTS organization has member schools across the United States, South America and Europe. Mr. Sepulveda is a member of the Kenpo Senior Council which is renowned for development of the art by some of the best Kenpo practitioners worldwide.